Some people say that Spring Drive is a quartz movement because the time is calculated by the frequency of the quartz oscillation rather than that of the balance spring and there is no escapement. 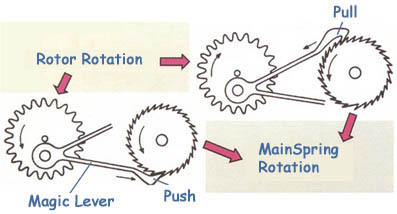 However, the design of Spring Drive bases on the mechnical watch movement, there is an Tri-synchro Regulator which operates as the conventional escapement. 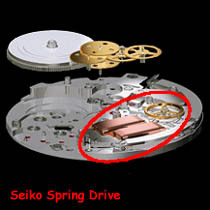 The idea of Spring Drive was conceived in 1977 by an engineer at SEIKO EPSON's Suwa plant in Japan. There are 3 key innovations make Spring Drive possible. 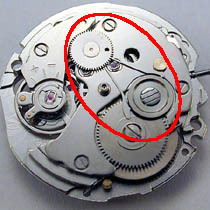 Tri-synchro regulator (section in red) replaces the escapement - the weakest and most vulnerable part of the traditional watch mechanism. Glide Wheel - this wheel, which is controled by the electro-magnetic coil, connect the Tri-synchro regulator with the traditional wheel train and turns 8 times per second. An entirely new spring was created using a new high elastic material called Spron 510 to create more power. The result is a mainspring can deliver more power more smoothly and longer - Spring Drive has a power reserve of 72 hours. Spron 510 is the registered trademark of Seiko Instruments Inc. 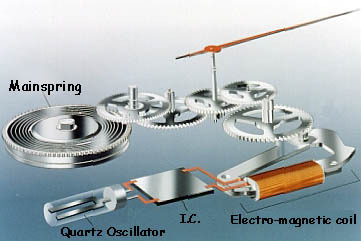 The electrical power required by the Quartz oscillator and the I.C. is generated by the electro-magnetic coil. The energy releases from the Mainspring, passes through the wheel train and exchanges the mechanical energy for the electricity. The new Magic Lever system allows for more efficient transmission of the rotor's power to the mainspring. It is fitted directly to the shaft of the rotor and thus creates more efficient winding of the spring. This new system is 30% more efficient than traditional automatic winding systems. The only one difference is the "source of time " and the control mechanism - Tri-synchro regulator. This new concept brings us a high accuracy of time display --- ±1sec / day. Therefore, some people say that Spring Drive is a quartz watch.